You won’t believe how easy this comes together in just 15 minutes – perfect for those busy weeknights! We’ve had Butters for about 2 weeks now and we cannot be more in love. He chews and bites through anything and everything, including electrical cords, desk chairs and cardboard boxes, which is his absolute favorite. But when he falls asleep on my foot or in the middle of a belly rub, my heart just melts a little bit. And with a face like this, it’s hard to stay mad at him for longer than 30 seconds. Butters is an absolute sweetheart, and like I said, we fall in love with him more and more as each day goes by. But enough about his cuteness – let’s talk pasta! 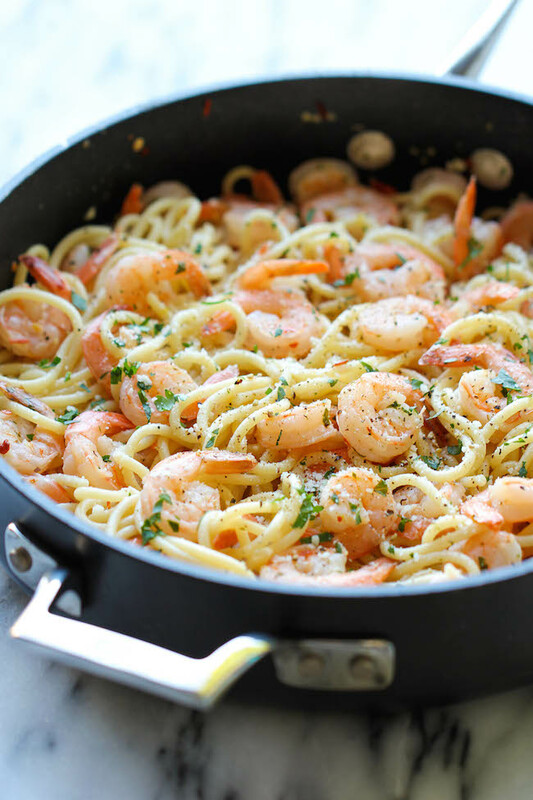 My mother would make shrimp scampi quite often when I was growing up, but it always came out of the freezer. She’d stock up on those Costco shrimp scampi boxes where everything was prepackaged and all that was left to do was either microwave or heat through over stovetop. But now that I’ve tried this incredibly easy homemade version, I don’t know why anyone would opt for the freezer kind! This may be hard to believe but this really comes together in just 15 minutes. 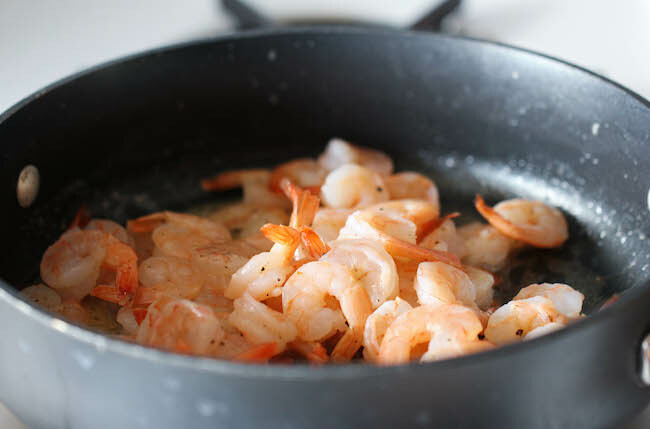 The only time consuming part may be the peeling of the shrimp, but if you’re short on time, you can even purchase the pre-peeled ones. Hey, I’m not one to judge – I’ve done that on several occasions, especially on those busy nights! 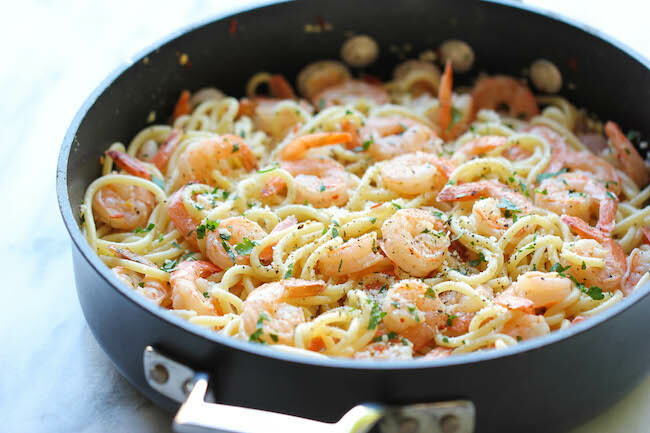 Once your shrimp is ready to go, you’ll saute that in a bit of butter, then you’ll deglaze with wine and lemon juice, and toss in that cooked linguine. 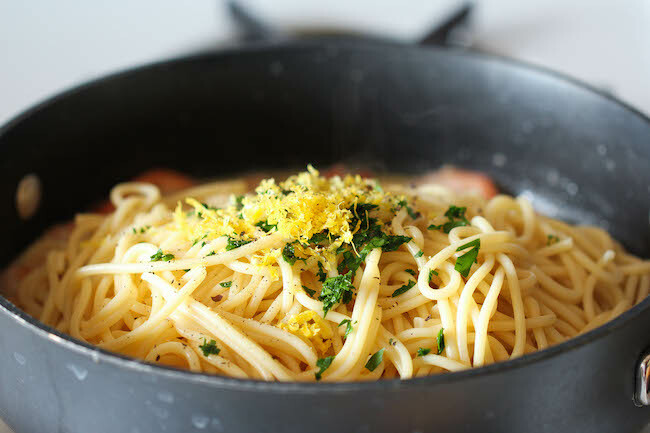 You can garnish with some Parmesan cheese, and serve right out of the pan. Done and done! Now who still wants the freezer kind out of a box? Stir in wine and lemon juice; season with salt and pepper, to taste. Bring to a simmer; remove from heat and stir in pasta, lemon zest and parsley. *Chicken stock can be used for white wine as a non-alcoholic substitute.